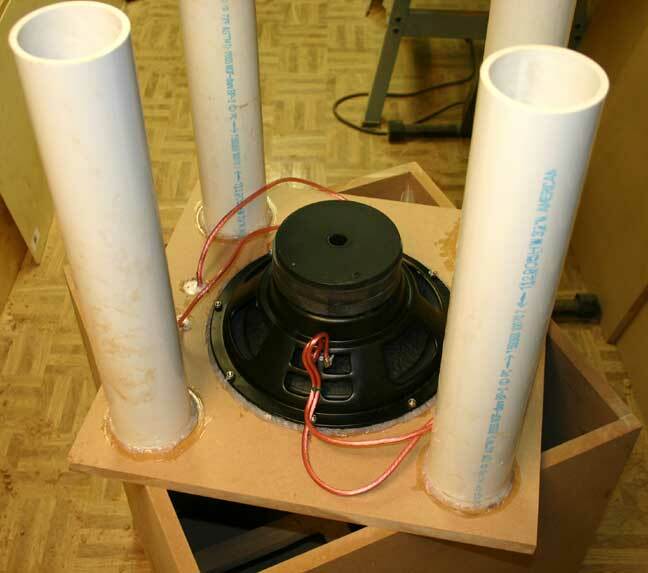 Having listened to quality audio over the years, and listened to a few subwoofers (including ones that I made), I decided to build a subwoofer for home audio use. This sub is intended to complement a pair of Magnepan MGMC1 speakers, which have a rated response of 80 Hz - 24 kHz +- 3 dB, with 86 dB sensitivity at 2.83 Vpp (2 Vrms) at 500 Hz. These are an amazing set of speakers that I could dedicate an entire page to, but haven't had time yet. Let me just say that I am continuously surprised by hearing new subtle things in music I have been listening to for years, such as the sound of a finder rubbing over a guitar string, or a shoe tapping on the floor. Unfortunately with their small size (well, small for Maggies), they have little bass response. For this project, based upon various online reviews and some design plots, I chose the Adire Audio Shiva Mark V driver. I waited almost a year for this driver to become available (Adire seems to produce them sporadically and in small batches), but was finally able to secure one from Creative Sound Solutions in Canada in early 2006. Free-air Resonance is generally about the lowest frequency a driver can be used. 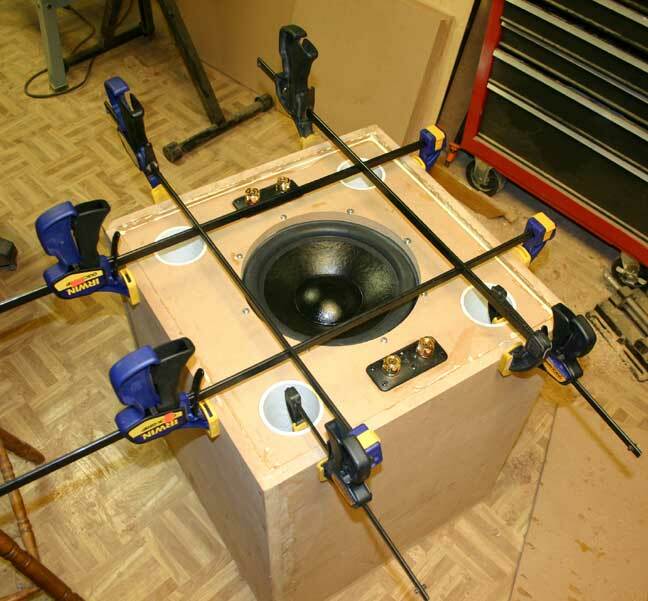 For best results, drivers in both the subwoofer and the speakers should be linear 1 octave beyond crossover frequency (assuming a 1st order or 6 dB/octave crossover). Sharper crossovers allow for placing the crossover frequency closer to either the speaker's or subwoofer's cutoff frequency. In my case, I am using a 3rd order (18 dB/octave) crossover, which allows me to keep my crossover frequency much closer to the 80 Hz low-end of the main speakers, which in turn keeps the subwoofer from producing higher frequencies that are considered directional (a 1st order crossover would have called for a 160 Hz cutoff frequency; with a 3rd order I can run more in the 80-100 Hz range). When designing a box for a subwoofer, frequency response is a first-order effect; Phase response (group delay) is a 2nd or 3rd order effect and should only be considered after the frequency response is optimized. Assuming no limitation on box size/volume, a 4th order vented box makes most sense. Un-vented boxes have narrower bandwidth (though smaller size). 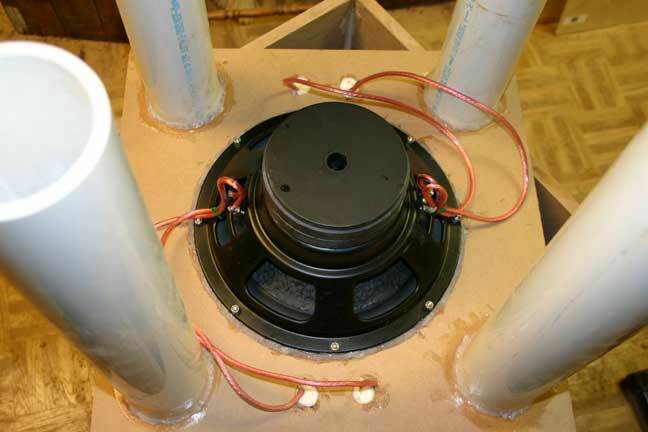 Higher-order vented boxes only add an acoustic crossover at the high end. Since we are using an electronic crossover already, nothing is gained (unless the speaker is driven to distortion). Lower order (e.g., sealed) boxes tend to have lower group delay, peakier frequency response and slower rolloffs. Higher-order boxes have higher group delays, smoother frequency reponses and sharper rolloffs. Drivers with a Q(ts) of 0.2-0.5 generally will give satisfactory results in ported enclosures. Use drivers with Q(ts)>0.4 should be used in closed boxes. Equivalent Bandwidth Product (EBP) = Fs / Q(es); drivers with EBP < 50 are good for sealed boxes; 50 < EBP < 100 are good for vented boxes; EBP > 100 is good for horn-loaded designs. Downfiring vs. sidefiring design? You need to consider driver/cone mass. % sag = 981,000 / (Xmax * (2 * pi * Fs)^2 ) in "%". Xmax in mm, Fs in Hz, 981,100 is g in (mm/s^2)*100%. If > 5%, don't use this driver in downfiring configuration. Using an old iMac and True Audio's MacSpeakerz design package, I ran a few scenarios. My intention was to build a box that could serve as an end table as well (so it didn't take over the room). 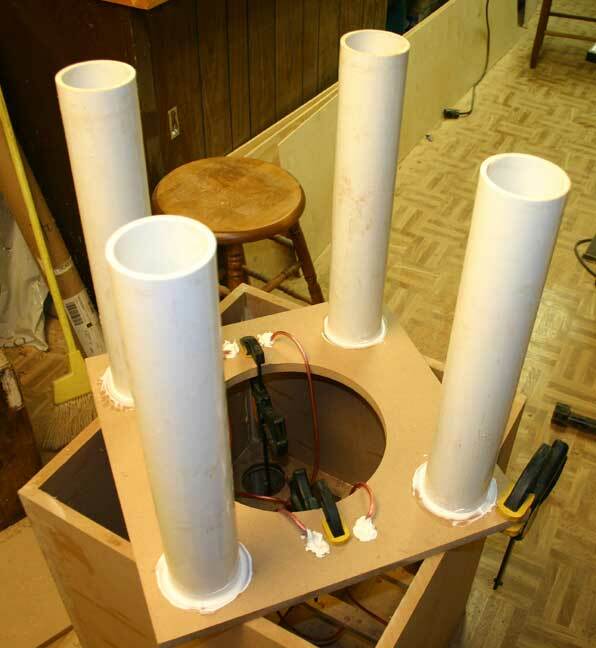 Hence I aimed for a target volume of 5 ft^3, which would give me the height I wanted and enough room to mount the 12" driver. 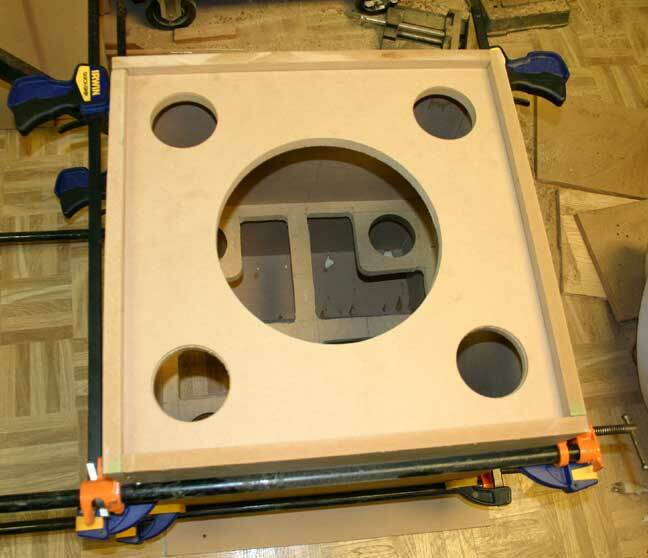 Ported boxes tend to have flatter frequency responses and are able to drive lower with reasonable group delays than sealed boxes, but at the expense of size. Playing with a few scenarios, I chose a 4th order vented design. Frequency response and group delay for the 5 ft^3 4th order vented design. Peak group delay of around 30 ms is at the -3 dB point of about 23 Hz. Click image for a larger PDF version. Frequency response and impedance for the chosen design. Click image for a larger PDF version. From the design, I whipped together a CAD layout to ensure everything would fit together okay. Wire-frame layout. Box is upside down (drive goes in the large hole in the top of the picture). The vent are is divided into 4 tubes around the perimeter of the driver. An internal brace is place at the Golden Ratio between the top and bottom of the box. Hidden line rendering of the box, again upside down. You can see the brace through the driver hole. Initial layup of the design. I used 3/4" MDF for the primary carcass. On to this I laminated 1/4" birch-faced plywood, then a veneer of mahogany. Internal brace is seen in the box. The drive panel is not glued in at this time -- it is only in place to align the sides. Internal dimensions are approximately 20" x 20" x 24". 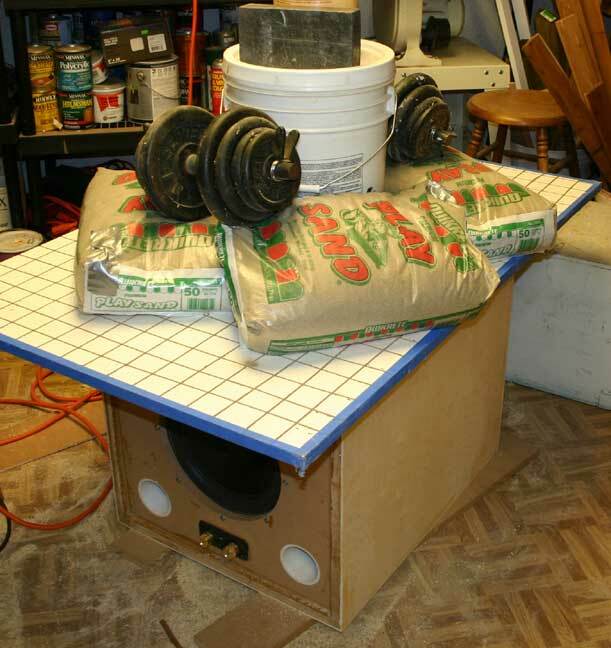 The frequencies I am trying to produce with this box are so low (< 120 Hz) that I am not worried about internal resonances (wavelength in air for 120 Hz is over 9 feet), hence didn't build the box to Golden Ratio or anything fancy. 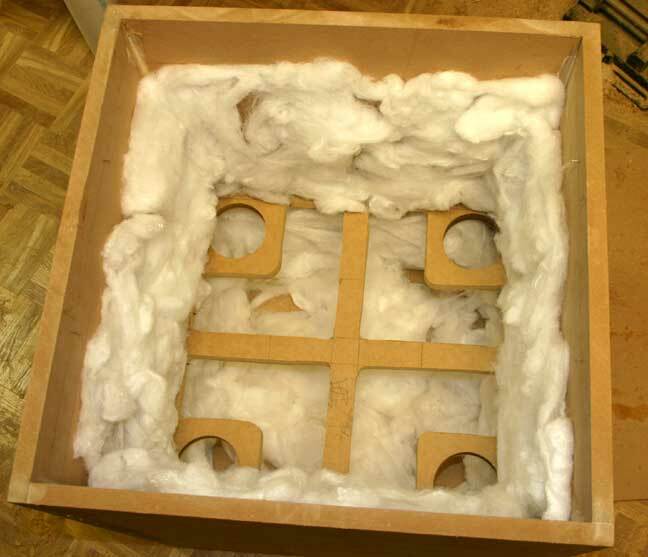 Most of the interior of the box is lined with Acousta-Suff polyfil. I used 3" ID PVC pipe from Home Depot for the port material. The edges are radiused, though you can't see this in the pictures. The ports are set into the driver plate, and through the internal brace. There is about 5" between the ends of the ports and the top of the box. 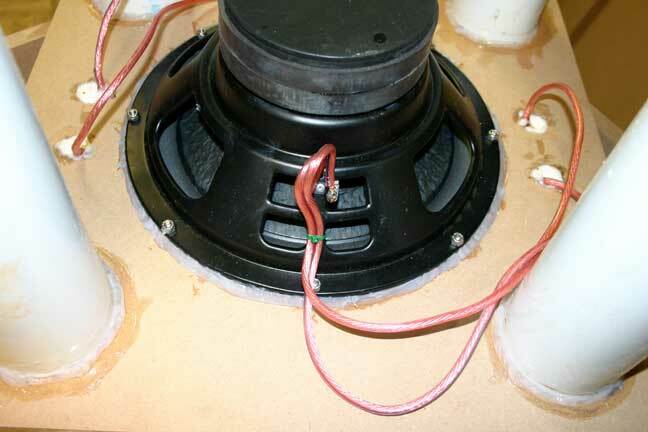 The clamps are holding the speaker terminals (it's a dual-voice coil driver, so there are two sets of terminals). Holes for terminals are filled with acrylic latex caulk. Mounting of driver. Drive was mounted from the rear, and was caulked and through-bolted using stainless hardware and nylock nuts. Cable is Monster Cable knock-off from Parts Express. Connections are all soldered. Another view of the driver mounting. And another view of the driver mounting. Cables are wire-tied to driver basket. Driver in box (box is still upside down). Lots of clamps to ensure everything is tight. The box is glued, screwed and biscuit-joined on all joints except the driver panel (which is only glued and screwed). Laminating the 1/4" birch-faced plywood to the MDF. This was done primarily to build up thickness of the box, as well as to cover the screw holes in preparation for the mahogany veneer. The caul is a piece of 3/4" particle board with melamine facing. 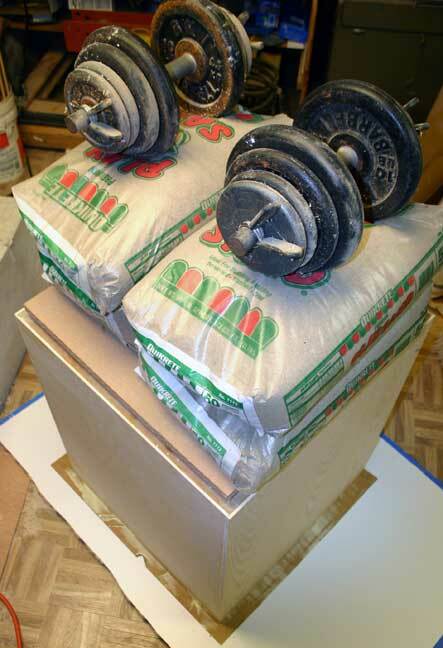 There is about 400# of dead weight (4x50# sand, 2x55# dumbbells, 5-gal bucket of paint, 1 lead brick, and caul) pressing the plywood down. Laminating the mahogany veneer to the birch plywood. This was done for aesthetic purposes. Actual frequency response. Box is peakier at 60 Hz than expected!